The night before Leslie Tooze ’16 died, his identical twin Lamar ’16 had a dream. In it, a bullet pierced his brother’s brain in the soft gap between the ear and the edge of Leslie’s standard-issue Army helmet. Early the next morning—just weeks before the Great War would end—Lamar warned Leslie not to fight. The brothers had recently been reunited on the edge of northeast France’s Argonne Forest, finally stationed together in the 364th Infantry after spending most of the war apart. Despite Lamar’s warning, Leslie, head of his platoon, had no choice but to fight. Into the forest he soldiered toward what was indeed his last battle. 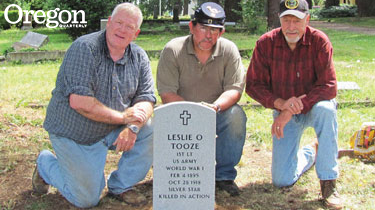 The valor Leslie showed that day leading his men would earn him the nation’s third-highest military decoration, the Silver Star. It would also cost him his life. When Lamar received the news, he braved war’s infamous No Man’s Land to retrieve his brother’s body. A bullet had hit his twin exactly where Lamar’s dream had foretold. Decades later, Mary Wood—Lamar’s granddaughter, Leslie’s grandniece—recites this story from memory. “In my family, we were taught to always, always trust your intuition. Always trust your dreams,” she says. An identical twin herself, Wood says the story went down in family history as a lesson to follow your instincts. Her grandfather never fully recovered from the loss of his other half, she adds. 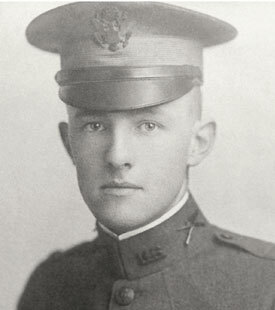 After the battlefields of Europe, Leslie returned home and completed the Harvard Law School education he and his brother had started before the war. He also continued to serve in the Army, where, by the end of the next great war, he was a two-star general. Upon retiring from the military, Lamar settled in Portland where he worked as a lawyer—a local firm still bears the Tooze name—and raised a family. For the past two decades, Lamar’s granddaughter Mary has taught law at the University of Oregon (lawyers, like twins, run in the family). Wood knew her grandfather and great uncle were alumni, but she hadn’t realized her office in Knight Law Center was just a short walk away from a memorial to Leslie in the Eugene Pioneer Cemetery behind Knight Library. It was the autumn of 1921 when Leslie’s body returned from a hasty wartime burial in France to be reinterred near the campus he loved. The campus where Lamar had been student body president and Leslie had been editor of the annual YMCA handbook. Where their active participation in Beta Theta Pi fraternity, the YMCA cabinet, and Alpha Kappa Psi honor society had marked them as a dynamic duo other students and faculty members referred to as “the Tooze twins.” Many notable Ducks attended Leslie’s funeral; honorary pallbearers included the editor of the Eugene Guard, school deans Colin Dyment and Eric W. Allen, and University president Prince Lucien Campbell. As Campbell would say during the funeral, Leslie held a special place in the heart of the University. More than ninety years later, Wood heard from the Eugene Pioneer Cemetery Association (EPCA) that her great uncle was going to receive another honor: a headstone commemorating his service. Made of granite, the stone came courtesy of the federal government and the year-long work of two dedicated researchers. Intrigued by records showing Leslie’s birth and death years, EPCA member Dorothy Brandner partnered with Randy Fletcher ’80 to verify that Leslie had served in World War I and thus qualified to receive a headstone from the Department of Veteran Affairs (VA). Researching a Great War vet was a bit of a departure for Fletcher, a military buff whose primary interest resulted in the book Hidden History of Civil War Oregon (History Press, 2011). But, Fletcher says, the time was well spent for a fellow Duck. With a day job as an emergency response officer at FEMA, Fletcher is no stranger to filing paperwork. Leslie’s case, however, proved particularly challenging. The military records typically required by the VA had been lost decades earlier in a fire at the National Personnel Records Center, a development that forced Fletcher to dig deeper. He eventually discovered a book coauthored by Lamar about the 364th Infantry. To muster a case strong enough to convince the federal government, Fletcher also collected state records proving Leslie’s enlistment and fielded follow-up questions from the VA. Finally, after months of work, the marker was approved and sent to Eugene. It was only after the stone arrived that Brandner learned from Wood’s family that Leslie’s body had been moved a third time. Years earlier, Leslie’s mother had her son’s remains once again relocated, this time to their final resting place in Portland’s Riverview Abbey. Where Leslie is, however, doesn’t matter as much as his sacrifice, and so the EPCA elected to mount the marker to honor the price the young man paid so soon after graduation. So it was on one particularly humid summer morning that three men set out to dig a hole. Cemetery volunteers Cabot Clark, Doug Sebranek, and Tony Pasillas had already placed one marker that day. Leslie’s plot, though, was up against a tree. After struggling through a century’s worth of gnarled roots, the men lifted the forty-inch, 250-pound marker into the ground. When the Tooze twins still roamed campus, the cemetery sprawled on the far edge of the UO while McArthur Court was but a gleam in Ellis Lawrence’s eye. Nowadays, the cemetery’s western edge borders a busy bike path that runs from East 18th Avenue behind Beall Concert Hall and past Knight Library. The morning’s many passersby gawked at what looked like three poorly scheduled grave robbers. One large gaggle of students wrenched eyes away from smartphones and iPods to look at a token of a war that their great-great-grandparents had fought. Winded from their exertion, Clark, Sebranek, and Pasillas stood back to look at their morning’s work before kneeling to take a photo by the tombstone of a man they’d never known but would always respect. The marker’s granite gleamed among the moss-covered stones of neighboring graves; it looks as if Leslie’s war just ended yesterday.